This juice mixing system,also called juuice mixer, is a kind of production technology based on specific properties of various juices. The mixing process is made according to different prescriptions of juices. The normal mixing process of juices includes dissolving sugar to make syrup, filtering the sugar syrup, diluting concentrated juices, mixing different juices, pasteurizing, and rinsing CIP. 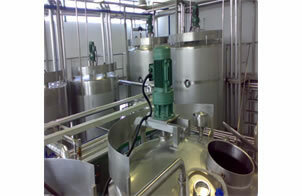 Take bottled juice production by concentrated one for example. Before mixing concentrated juices, users should add proper water to pre-dissolve and dilute highly concentrated juices. Then juices is sent to mixing tank where syrup, other auxiliary ingredients and water are added. After that, you can mix juices and customize its volume. Specific technology should be made based on practical conditions and expectations of different products. Founded in 2006, our company is a leading manufacturer and supplier of juice mixing system ( juice mixer) in China. Here in Topling, we mainly offer water filling line, juice filling production line, carbonated drink filling line and related equipments including rinsing filling capping machine, beverage mixer, reverse osmosis equipment and other related machines. We offer installing and debugging services of our devices and staff training for factories abroad and OEM service. For more guides of juice mixing system (juice mixer), please contact us.